After the first red-band trailer debuted earlier this week, a new green-band trailer for Seth Rogen and Evan Goldberg‘s This Is the End is now available. The film definitely looks funny, but I’m wondering how long the premise of celebrity-self-parody can last. 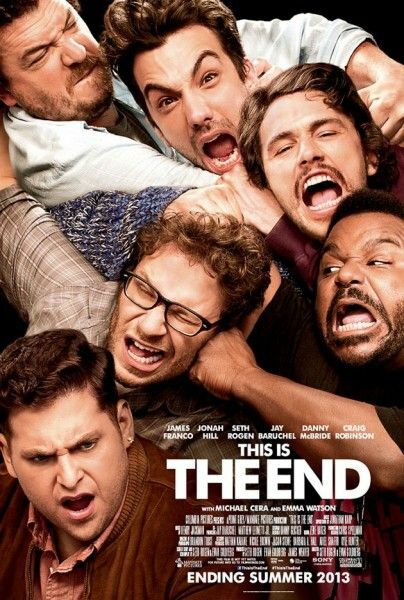 Usually, this kind of performance is a cameo, but This Is the End is all about Rogen, Jonah Hill, James Franco, Danny McBride, Jay Baruchel, and Craig Robinson playing “versions” of themselves. I’m assuming that as long as the quips and jokes keep coming as quickly as they do in this trailer, then the self-parody won’t wear out its welcome. Hit the jump to check out the trailer. The film also stars Jason Segel, Michael Cera, Emma Watson, Paul Rudd, Mindy Kaling, Kevin Hart, Aziz Ansari, Martin Starr, and more. This Is the End opens June 12th.